Three little pigs. Blending Design Thinking with Agile for human-centred change. Agile and Design Thinking share a lot: systems thinking, empiricism, iteration, human-centred,... 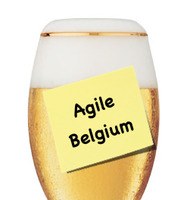 But how can you bring them together in your day-to-day agile practice? This session will introduce the basic principles behind Design Thinking. It will also tell the story of how to blend them into your practice as a scrum master or product owner. Allowing better focus on value, end-users, stakeholder alignement and prioritisation. Based on a specific case at VRT. Featuring tools such as Jobs-to-be-done, Hamburger slicing, ideation workshops and many more. Are you organizing Three little pigs. Blending Design Thinking with Agile for human-centred change.? Claim Three little pigs. Blending Design Thinking with Agile for human-centred change. Are you an organizer of Three little pigs. Blending Design Thinking with Agile for human-centred change. ?